For the past few years I have been trying to love rhubarb. I mean, really trying. It is a beautiful garden plant that grows in my area, but I have always been stumped on what to do with it. Because of it’s natural sourness, rhubarb recipes usually call for huge amounts of sugar to make them palatable. Enter the following recipe from “Rawsome Vegan Baking” by Emily von Euw. A fellow British Columbian, her recipes are always super fresh and delicious. I have been so inspired by her blog and encourage all of you to check her out. Dice the rhubarb into bite size pieces and place in a dish. Cover with the maple syrup. You can either now dehydrate the rhubarb/maple syrup or place in your oven at the lowest setting for a few hours (I did this the night before- 170C for about 4 hours). The rhubarb should be soft and sweet. Place in a food processor and pulse until ingredients are finely chopped and starting to come together. Use a cookie cutter (mine was 3 inches across) as a mold and pack down some of the “crumble” mixture. Spoon rhubarb over the top, compacting everything so it holds together. Remove mold and repeat until all of the ingredients are used up. Drizzle with remaining maple syrup. Store in fridge for a few hours (if you can wait!). Devour in the sun! 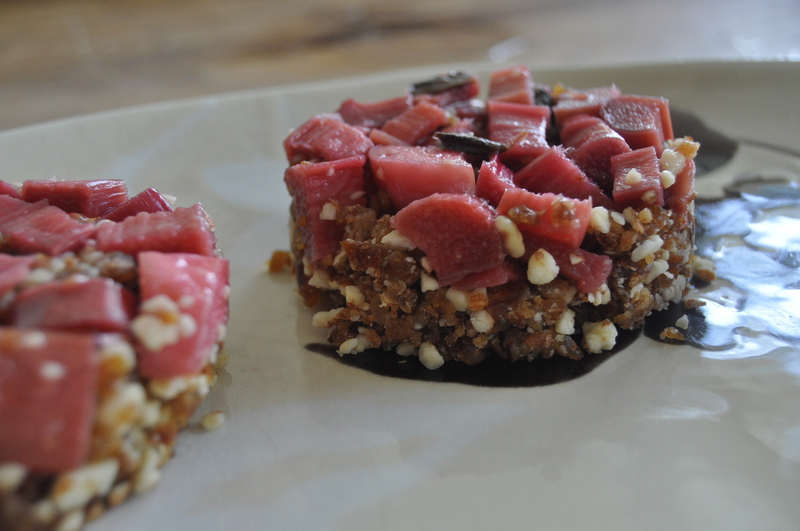 This entry was posted in dessert, raw, snack, vegan, vegetarian and tagged dairy free, food, fresh, gluten free, healthy, raw, recipe, rhubarb, summer, sweet, treat, vegan. Bookmark the permalink.